First and foremost, thank you to our many chapter members, major corporate partners, major corporate owners, and strategic alliances for their support as we embark on our 50th year Anniversary. Nothing we do is more important than developing our Student Chapters and K-12 STEM Program outreach. NAMC will attend FAMU’s Career & Industry Day in April 2019 with Dr. Doreen Kobelo, Construction/Civil Engineering Technology Department Associate Professor and Program Area Coordinator, along with NAMC faculty advisor Josh Iorio, Assistant Director, Graduate Programs Coordinator, Myers-Lawson School of Construction at Virginia Tech. NAMC is addressing disparities in internship placement and employment opportunities for Historically Black Colleges and Universities (HBCU) students. Rates for internship placement and employment opportunities can be as much as 50% lower than mainstream colleges whose rates are as high as 100% placement. Despite these disparities, the industry claims to have a workforce shortage. NAMC is working with the technical industry on bridging the digital divide gap. Jason Trimiew, Head of Supplier Diversity at Facebook, facilitated NAMC's introduction to Alex Alvarez, diversity manager for the Apple Corporation and chairman of the Technology Industry Group (TIG). The introduction culminated in a NAMC presentation to TIG in October 2018 in Austin, Texas. NAMC spoke on data and fulfillment center construction and ways to incorporate diversity in these projects. As a result, Google has become NAMC's newest major corporate partner. Have a positive and productive 2019!! Laquila Group, a contractor based in New York City, settled a $625,000 U.S. Equal Employment Opportunity Commission discrimination lawsuit after six African-American employees claimed they had been the targets of racial slurs. The six alleged that in addition to the denigrating comments, company foreman made them use separate bathroom facilities outside on the project. A female carpenter, sued her former employer, Pabco Construction Corporation, Farmingdale, New York, alleging that she was fired because of her gender and that during her employment she and other women were not given the same opportunities for overtime work, training, or career advancement. The employee filed an official complaint with her union which stated she was also the target of disparaging and condescending remarks claiming that women did not belong on construction job sites. The case is headed for a jury trial, according to the latest documents filed with the U.S. District Court for the Southern District of New York. We must stand up against discrimination, lack of hiring, and the unfair firing of minority workers. 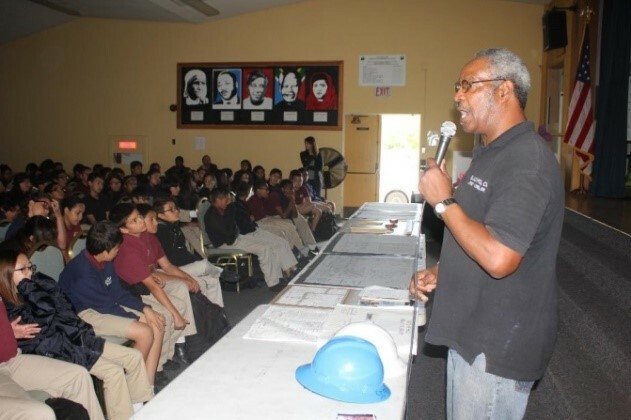 While building the new Skyline Library in San Diego, California, NAMC had opportunities to give back to the community through the NAMC Science, Technology, Engineering, and Math (STEM) Program initiative for middle school students. Dr. Barbara Gafford-Hampton requested NAMC to continue to reach out to middle school students in DeKalb County, Georgia to encourage those students to continue to participate in STEM programs through presentations and information outlining construction and engineering as an alternative career to pursue. 1. What inspired you to choose this career? What challenges did you overcome to achieve this career? 2. What classes or special training did you participate while in middle, high school and college? 3. Please share about your college or training experience (classes you took, clubs/activities you were involved in) and how college prepared you for your career. 4. What are challenges do you face with your career and what do you enjoy the most about your career? 5. What skills and education(college, training) will students need to attain this career? The NAMC IConstruction Training Program congratulates students who graduated from the Baker County, Florida Sheriff Re-entry Center Training Unit's electrical trade program. The NAMC IConstruction Training Program offers NCCER-accredited program modules in several trades. The main goal of the program is to "certify underserved and underemployed individuals reentering society and veterans with trade skills with the goal of achieving sustained job placement", said Larry Leonard, NAMC IConstruction Program National Training Director, in Jacksonville, Florida. NCCER-certified NAMC instructors provide training in the areas of carpentry, concrete, drywall and electrical. The pre-apprenticeship program offers students course instruction in areas such as drywall assemblies, solar panel installations, HVAC mechanicals and building automation controls, superintendent/foreman leadership, and more. NAMC would like to welcome Google as a new Major Corporate Partner (MCP/MCO) and thanks them for their commitment to increasing diversity and inclusion opportunities for DBE firms. NAMC also welcomes the NAMC Columbus, Ohio Chapter, Dan Moncrief, Chapter President, Mayo Makinde, Executive Director. Please contact the chapter directly with questions regarding upcoming events or membership. The National Association of Minority Contractors boasts chapters all over the country. We are committing to highlighting those chapters and their members. Congratulations to NAMC member Felipe Molina of Genesis Cabling Solutions for being recognized this year with Houston Minority Supplier Development Council (HMSDC’s) prestigious Emerging 10 Award. Felipe shares the award with his partner, Carol MacNeil, who also serves on NAMC Houston's Board of Directors. Genesis Cabling is a provider of turnkey data, telecom and IT solutions with over 20 years of experience in the Houston market. Congratulations to NAMC member, Attorney Kenneth Stephens, Managing Partner of Stephens PLLC Attorneys & Counselors at Law, who was also recognized with HMSDC’s prestigious Emerging 10 award. Kenneth serves as NAMC Houston Chapter's Board of Directors legal adviser and is an avid contributor to the organization's educational initiatives. Stephens PLLC is a full service law firm specialized in the fields of commercial litigation and construction law in Texas. Founded in Oakland, California in 1969 by Ray Dones and Joseph Debro, NAMC is the oldest minority construction trade association in the United States with over 50 Hall of Fame members and Legacy Contractor Builders, a combined annual project capacity of over a billion dollars, and more than 10,000 skilled workers nationally. Through a network of local chapters and in collaboration with strategic and corporate partnerships, NAMC assists members with building capacity by providing access to opportunity, advocacy, and contractor development training. The National Association of Minority Contractors (NAMC) is pleased to recognize Kendra Stuart as one of three NAMC Student Chapter scholarship award recipients who attended NAMC’s 49th National Conference in Plano, Texas in June 2018. Ms. Stuart is a construction engineering major at Florida A&M University (FAMU). In 2017, she participated in the Dwight David Eisenhower Transportation Research Board in a project which examined transportation industry design solutions to alleviate traffic congestion by utilizing high-speed bullet trains. In connection with this research, Ms. Stuart wrote a paper titled Cost-Benefit Analysis of High-Speed Trains in the UnitedStates and attended the Transportation Research Board (TRB) 97th Annual Meeting. She has also served in leadership roles in FAMU’s AGC Student Club, and after becoming acquainted with NAMC, was successful in starting a NAMC Student Chapter group on FAMU’s campus. The group currently meets on a bi-weekly basis. A native of the Bahamas, Kendra is a member of the Tau Sigma Honor Society for transfer students. She looks forward to graduating in the spring of 2019 where she will pursue a career as a project engineer. For more information about the NAMC Student Chapter or becoming a member, contact the NAMC National Office at (202) 296-1600 or dlittlejohn@namcnational.org.